He became a conducting sensation practically overnight and at age 31 is at the height of celebrity. Music director of the Los Angeles Philharmonic and in demand by the world’s greatest orchestras, where does he go from here? It began like this. In early spring, 2004, Gustavo Dudamel had just finished a stint as assistant to Simon Rattle at the Berlin Philharmonic, and the 23-year-old Venezuelan felt homesick for Caracas. He had been encouraged to enter the Gustav Mahler Conducting Competition just established by the Bamberg Symphony, and that meant another two weeks in Germany. But since Dudamel would be among the youngest of 299 entrants, he figured he would be back with family and friends soon enough. When it came his turn to rehearse the Bambergers, Dudamel gave an upbeat, and what he heard caused him to drop his baton and exclaim, “Wow!” Although he had worked extensively with youth orchestras in Venezuela, he had had little experience standing in front of a polished professional ensemble. Still, within minutes, Dudamel was reportedly in command. He won the competition and gave what was by all accounts a riveting performance of Mahler’s Fifth symphony without even being afforded a full run-through of the demanding 70-minute score. One of the Bamberg judges was Esa-Pekka Salonen, who immediately telephoned his boss, Deborah Borda, president of the Los Angeles Philharmonic. He told her that Bamberg’s winner was a conducting animal and urged her to engage him to make his U.S. debut in L.A.
A year later, Dudamel appeared at the Hollywood Bowl with the Philharmonic. His long sideburns, curly hair, twinkle in his eye, and expression of continual wonder appeared all but tailored for the Bowl’s jumbo video screens. He disarmed his audience by immediately launching into Silvestre Revueltas’s La Noche de los Mayas with such compelling enthusiasm and Revueltasian grandeur that something rare and remarkable happened. Music isn’t always treated as the number one attraction in the 18,000-seat amphitheater. But on that warm night in September, the picnickers next to me put down their super-sized bag of Cheetos—and listened. The rest, as everyone surely knows, is history. Dudamel became a conducting sensation practically overnight. Now, a mere eight years since that fateful first upbeat in Bamberg, Gustavo Dudamel, at age 31, is Musical America’s Musician of the Year. He is also as close to being a rock star as any conductor has yet gotten. When I broke the news in the Los Angeles Times on Easter Sunday, 2007, that this young Venezuelan had been appointed to succeed Salonen as music director of the Los Angeles Philharmonic, I was startled to get calls asking for comment from a New Delhi radio station and, believe it or not, Al Jazeera. By now Dudamel is a household name in L.A. He is mobbed in Berlin, Vienna, Milan, and London. In Caracas, he induces Beatles-like screams from hysterical teenagers. As one of his country’s best-known and mostloved celebrities, Dudamel is swarmed by fans on the street, and they run up to the stage during his curtain calls to get his autograph. The comparisons are always with Leonard Bernstein, and they are not inapt. Dudamel certainly boasts a Bernsteinian charisma. He is, as was Bernstein, a tireless advocate for music education. Like Bernstein, Dudamel puts expression first. And like Bernstein, Dudamel is a spiritual seeker, an inveterate chance taker ever pushing his limits. But where Dudamel resembles Bernstein the most, and where that resemblance matters most, is in the way in which Dudamel doesn’t resemble Bernstein at all. Bernstein was the first great all-American conductor, a proud outsider to a Eurocentric classical-music culture. Thanks to El Sistema, he is from a radically different background from that of any major international conductor who has preceded him. Venezuela’s exceptional musiceducation program and its founder, José Antonio Abreu, are well examined elsewhere in this issue. 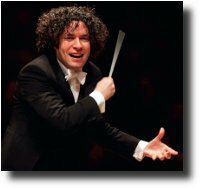 What they offered Dudamel was the opportunity for an unparalleled conductor’s training allied to a unique world view of music. The son of a trombonist, Dudamel began, like hundreds of thousands of other Venezuelan children, as a preschooler taking up the violin in a núcleo, or preparatory music school. He quickly became concertmaster of his kiddy orchestra in his hometown of Barquisimeto, and one afternoon when the orchestra’s instructor was late, Dudamel got up and spontaneously began to rehearse his classmates. It started as kidding around, but after a little while everyone instinctively began to work. When the conductor finally arrived, he watched for a while, realizing the boy had talent. At that moment, Dudamel’s apprenticeship began. This led to Dudamel being invited to study with Abreu in Caracas. The teenage conductor worked daily with youth ensembles, practicing his craft as an instrumentalist or dancer might, but as a conductor outside Sistema never can. At 18, he became music director of the Simón Bolívar Youth Orchestra, the elite ensemble of the many Sistema orchestras. Dudamel’s rise up the Sistema ranks now appears inevitable. His natural talents happen to be the ones that Abreu promotes. Dudamel is about as close to being a born conductor as it is possible to be. At 5 he spread out his toy soldiers like an orchestra and conducted them along with recordings of Stravinsky’s Rite of Spring. He is innately sociable. He has a photographic memory. Children in núcleos are taught practically from infancy to be ensemble players. They learn their instruments not in private study but in orchestral rehearsals. Older students coach younger ones, better students assist slower ones. A sense of common purpose, that music has a social and a spiritual purpose, is instilled from day one. The kids are expected to memorize music so that they will be in constant contact with the conductor and each other. They grow up playing together and their ensembles become organisms. There is always room for one more. Witnessing eight or nine hundred children excitedly sawing away on the 1812 Overture without a score in sight and in a room too small for an extra chair for a spectator is obviously thrilling to an outsider. But there is more to it than thrills. In a country with Venezuela’s shockingly high murder rate, the rich go through extravagant means to protect themselves from the poor, and for everyone else there is only security in numbers. On a profound level Sistema serves as a social safety valve. So when making music becomes a survival instinct, then the notes in a Tchaikovsky symphony really do represent, in a way perhaps unique to Venezuelan culture, a matter of life or death. Dudamel might appear to have now left a lot of that behind. A seasoned celebrity, he travels in the most exclusive music circles and works with the best players on the planet. He was, early on, taken under the wings of Claudio Abbado, Simon Rattle, Daniel Barenboim, Zubin Mehta, and Charles Dutoit. His career has been carefully guided by powerful and sophisticated management. He moved fast. The month before his Hollywood Bowl debut, Dudamel conducted the Gothenburg Symphony at the Proms in London when Neemi Järvi fell ill. That led to his being offered the position of music director of the 100-yearold orchestra in Sweden’s second city. For all his experience in Caracas, Dudamel still had much repertory to learn and much to learn about the way professional orchestras operate. Here was a place for maturing out of the limelight. This was also the period when invitations to guest conduct were flooding in—the Berlin Philharmonic, La Scala, the Vienna Philharmonic, the Concertgebouw, the New York Philharmonic. Dudamel was making his Chicago Symphony debut when the L.A. appointment was announced. And yet watching Dudamel at work is to see that instead of taking the boy out of Venezuela, he became a kind of one-man Sistema on steroids, the manifestation of the Venezuelan ethos writ large and vivid. Music for Dudamel is never external but something to be absorbed in his body and mind. He conducts just about all standard repertory, including concertos, from memory, not only in concert but also at rehearsals where he will often sing a passage to indicate where he wants to begin rather than give the bar number. He memorizes massive works he might be conducting for the first time (such as the Verdi Requiem). He memorizes instrumental parts used in auditions so that he can give the players his full attention. In rehearsal, Dudamel continually searches for metaphors to describe the connections between the real world and the musical effects. He can be a controversially extreme interpreter, constantly trying new things. In his first season with the Los Angeles Philharmonic, for instance, his performances often vacillated between joyful exuberance and mystical intensity, always present in the moment but occasionally structurally unconvincing. That season began like gangbusters in pure Sistema fashion. Insisting that his initial concert as the orchestra’s 11th music director not be a fancy-schmancy gala but an event for the community, he persuaded the Philharmonic to host a daylong program, “¡Bienvenido Gustavo!” that included pop and Latin acts. Dudamel conducted a children’s orchestra, YOLA, the Sistema-like Youth Orchestra of Los Angeles that he helped the Philharmonic found for disadvantaged youngsters and, to close, Beethoven’s Ninth with the L.A. musicians. Tickets were distributed for free with the best seats in front of the stage reserved for the families of the YOLA players, many attending their first symphony concert. Dudamel has said that in Los Angeles he did not set out to change the sound of the orchestra but to discover it. In fact, he has changed it from the lean, crystalline ensemble of Salonen to something thicker. He’s put fat on the strings, swollen the winds, and asked the brass to take risks. The orchestra, for Dudamel, is a great mass to be moved. Indeed, the Bolívars, which Dudamel continues to lead and which has now turned professional, operate on a more-the-merrier principle. Dudamel typically tours with 200 and uses nearly all of them even for a Beethoven symphony. At home a Mahler symphony might involve twice that number. For Dudamel the greater the mass of opulent orchestral sound, the greater possibilities it offers for color and for contrast (he has a love of the quietest pianissimos) along with, of course, electrifying grandeur. Size can also be an indicator of ambition, and Dudamel’s ambition has thus far been the most flabbergasting aspect of his tenure so far in L.A. That has been especially pronounced in his appetite for new music. In Caracas, Dudamel showed a fondness for contemporary Venezuelan composers, particularly the underrated Antonio Estévez. But his first major commissions were in Gothenburg, where he befriended the Swedish composer Anders Hillborg and premiered Sofia Gubaidulina’s Glorious Percussion. However, in L.A., where Salonen created an audience appetite for new music, eight or nine premieres a season are not uncommon, and Dudamel has been doing more new and recent work than any conductor of a major mainstream orchestra. For the gala concert in Disney Hall that followed “¡Bienvenido Gustavo!” and was broadcast around the world, Dudamel premiered John Adams’s richly complex, 45-minute symphonic City Noir, despite the fact that he had never conducted Adams’s music before and the star-studded audience might easily get antsy. Last season Dudamel took on a far more massive project with the premiere of Adams’s The Gospel According to the Other Mary, a vast operatic work. It was delivered so late by Adams, who is the orchestra’s creative consultant, that Dudamel had only a couple of weeks in which to learn and prepare it. At the time he was also conducting, from memory, a staged performance of a Frank Gehry-designed Don Giovanni, in Disney, the beginning of a three-year Mozart/Da Ponte cycle with the Los Angeles Philharmonic. On January 26, 2012, the day Dudamel turned 31, he conducted a confident, majestic, driven, tortured, ecstatic, joyful, serious Mahler Fifth Symphony at Disney. The orchestra was his Bolívars, with which he had recorded the symphony six years earlier and with which he has performed the score by now probably many hundred times. But it was hardly business as usual. He was in the middle of perhaps the craziest project a sane conductor has ever undertaken. In a period of 17 days, Dudamel led all nine Mahler symphonies, the Adagio of the Tenth, and Songs of a Wayfarer with the help of the Bolívars and the Los Angeles Philharmonic. For the Eighth, which he was leading for the first time and the only work he did not conduct from memory, he combined both orchestras. Dudamel then took the full project with both orchestras to Caracas where the symphonic cycle was compressed into less than two weeks. For the Eighth in Caracas, the chorus was over 1,200 and included young singers from all 17 states in Venezuela. The children sang from memory. When the members of the Philharmonic walked onstage for the rehearsal and saw an ocean of kids crowded together on row after row of creaky risers, the players gasped and took out their cell phones to shoot photos. No, the Mahler Project wasn’t normal. The symphonies weren’t played quite in order. There were days when Dudamel rehearsed two different symphonies with the Bolívars during the day and performed a third with the Philharmonic in the evening. He said he spent six months doing mental gymnastics in preparation. He experimented with tempos and interpretations. He could become obsessed with slowness as if entering into a Mahler slow movement and never wanting to emerge. He could also arrestingly speed up. He spent a great deal of effort illuminating details that he seemed to have fallen in love with. The symphonies the Los Angeles Philharmonic played were repeated on subscription concerts and they were never played the same way twice. There were days in which Dudamel was so exhausted he could hardly put a sentence together. This was not Mahler for the ages, but Mahler, as life is lived, for the moment. It was Dudamel’s attempt to get inside the composer in a concentrated way no performer has done before. Next year and in years after, Dudamel’s Mahler will no doubt be different, maybe very different. Dudamel is already at the height of celebrity and approaching the top of his profession. He has finished in Gothenburg but remains honorary conductor. He is committed to L.A. until 2019. He and his wife, Eloísa Maturén, had their first child, Martín, in 2011. He’s climbed the Mahler mountain. He has a shelf of prizes. At 31, Dudamel should be just beginning. The good news is that he knows it. Mark Swed is the music critic for the Los Angeles Times.